2016 was a rare year in American Presidential politics, as there was neither an incumbent President, nor Vice President in the race. Subsequently, the electoral field was wide open, particularly for candidates in the Republican party; a party that has historically had a presumptive nominee, even in elections where no sitting President or Vice President was among the runners. 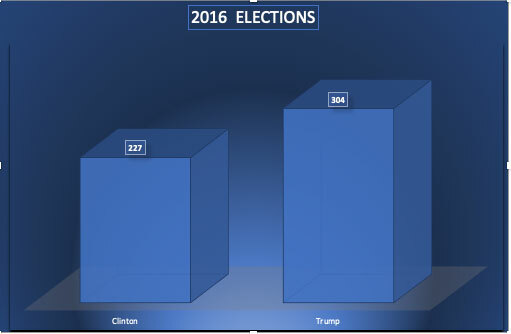 As a result, the 2016 Republican primary field of candidates was the largest in American history. When the primary cycle began, the Republicans had 17 major competitors who sought to receive their party’s nomination. However, before the first votes of the Iowa caucuses were held, the field of Republican Presidential hopefuls had narrowed to five contenders. Donald J. Trump, who began his campaign with attacks on Mexican immigrants, benefited from much greater media attention than any of his rivals. By March 16th, 2015 the only remaining candidates were Donald Trump, Senator Ted Cruz, and Governor John Kasich. On May 3rd, Trump won a decisive victory in Indiana, after which all of his opponents suspended their campaigns, and Donald Trump became the presumptive 2016 Republican Presidential nominee. Secretary of State, Hillary Clinton announced her bid for the Democratic nomination on April 12, 2015. On April 30th Independent Senator Bernie Sanders announced his intention to run for the Democratic nomination, as well. Several other contenders briefly entered the Democratic race. However, by the time of the New Hampshire Primary, (a contest which Sanders won), only Sanders and Clinton remained. The primary season continued throughout the Spring of 2016, with Clinton and Sanders contesting every primary. When the Democratic party’s primary process ended, Clinton had support from 54% of the pledged delegates; while 46% backed Sanders. In addition, Clinton had won 78% of the Super Delegates, who were national Democratic activists. On June 16, 2016, Sanders announced he would suspend his campaign. The Democratic Party held their 2016 Presidential convention from July 25th—28th in Philadelphia. The convention nominated Hillary Clinton as their Presidential candidate and choose Senator Tim Kaine of Virginia, as Clinton’s Vice Presidential running mate. The Republican Party held their 2016 Presidential convention from July 18th-21st, in Cleveland. Republicans selected Donald Trump as their Presidential Candidate and Indiana Governor Mike Pence, as Trump’s Vice Presidential running mate. Clinton primarily focused her campaign on economic and health care issues. She had an in-depth, wide-ranging portfolio of policies she planned to implement as President. In addition, Clinton was considered the winner in each of the debates. In contrast, the Trump campaign concentrated on his central theme of “Making America Great Again”. Trump’s campaign was nativist, calling for the construction of a wall along the Southern border of the country; a wall for which Trump promised Mexico would pay. Trump opposed all existing American trade agreements and called for greater isolationism; seeking to eliminate American involvement in the affairs of other countries. One past decision that negatively impacted Clinton’s Presidential bid was her practice, during her tenure as Secretary of State, of utilizing a private mail server at home, instead of using the servers housed at the State Department. Clinton’s conduct sparked major controversy and was investigated by the FBI, during the campaign. On July 5, 2016, the FBI announced that Clinton had committed no crime, and therefore, would not be charged. The matter of the e-mails remained mostly dormant, until October 28th, when the FBI Director James Comey informed Congress they had discovered a new block of e-mails during an investigation of an unrelated matter and planned to reopen the case against Clinton. On November 9th, just before election day, Comey announced that the FBI’s further investigation into Clinton had found nothing. However, many had already voted using early ballots. The rise of social media was another dominant force that influenced the outcome of the 2016 campaign. Stories, many of them fake, were spread like wildfire on Facebook, YouTube and Twitter, with users often unwilling, or unable to differentiate between real news and fake news. There was another unusual factor, which, by most accounts, affected the 2016 American Presidential campaign. Determining precisely what impact the Russians might have had on the outcome of the 2016 US Presidential election campaign will forever remain a great unknown. In early 2016, during the Presidential Primary Campaign, the Democratic National Committee servers were hacked by individuals working on behalf of the Russian intelligence services. In July 2016, information that was embarrassing to the Democrats and Hilary Clinton was leaked through the WikiLeaks organization. President Vladimir Putin of Russia made no effort to hide the fact he preferred Donald Trump as the next American President. The US intelligence community unanimously concluded that the Russians had indeed worked to elect Trump, both through hacking and ongoing on social media campaigns. Nevertheless, Clinton still maintained a clear lead in the polls throughout the campaign — and most observers considered Clinton the overwhelming favorite to win. Trump made history, by neglecting to earn a single endorsement from a major media outlet, including by newspapers that had always backed the Republican nominee. In October 2016, the Washington Post released a tape from a conversation Trump conducted with Billy Bush, host of the TV show “Access Hollywood,” in which Trump states speaking of women: "I don't even wait. And when you're a star, they let you do it. You can do anything. Grab them by the pu _ _y. You can do anything.” For a brief period, many Republican politicians withdrew their support for Trump. However, when it became clear Trump would not resign, the Republican leadership returned to the fold and once again supported Trump. Lastly, there were also two significant third party candidates who ran in the 2016 U.S. Presidential election — i.e. Gary Johnson, the Libertarian candidate and Jill Stein, the Green Party candidate. Neither had any chance of winning, but both served as spoilers in the election. 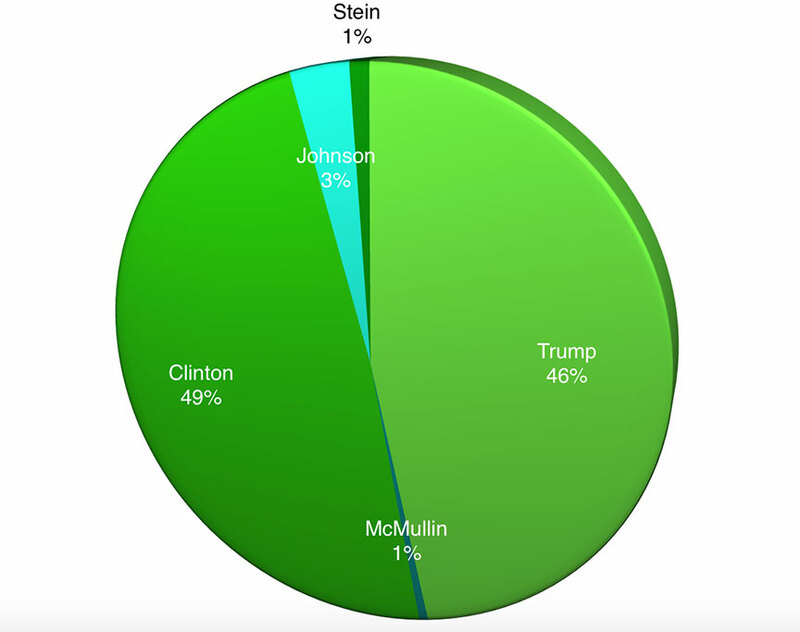 Gary Johnson drew away voters who might have voted for either candidate; while Stein, who claimed to be to the left of Clinton, and it is likely most of her supporters would have voted for Clinton, had Stein not run. On the days leading up to election, polls continued to show Clinton with a comfortable lead. On election day itself, Hillary Clinton did ultimately win the popular vote. However, the voters of Wisconsin, Michigan, and Pennsylvania —who all traditionally vote for Democratic candidates— voted for Trump by a narrow majority. 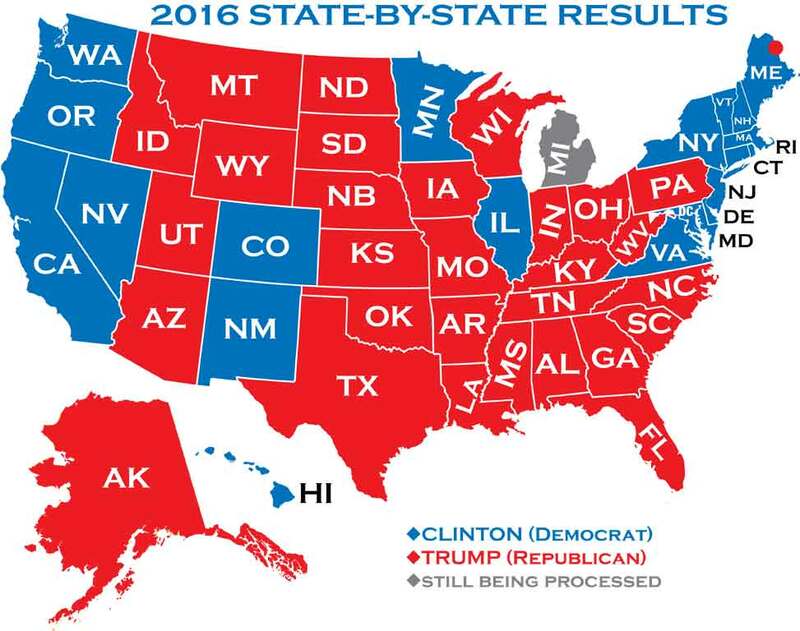 The surprising swing in the votes of those three states led to Trump’s electoral college victory. It should be noted that the difference by which Trump won in Wisconsin, Michigan, and Pennsylvania was less than the total of the votes received Green Party candidate Jill Stein in those three states. Hawaii Clinton 251,853 62.3 Trump 121,648 301. Totall Clinton 64,637,140 49% Trump 64,637,140 46.